That our dreams will never be. We'll burn a candle too. And shed some tears for you. If only you weren't gone. We'd sing the birthday song. These plans we'll never know. With no tiny lips to blow. ...as we send to you our love. August 31st, 2002: Well the day is finally here, George has been on vacation the past week. We broke down yesterday evening when we got home, we had tried to stay extra busy the past few days, it was helping at the time....we ran out of things to do and got a couple of cards in the mail and my husband's brother and sister in law had dropped of a gift and a card while we were out. It is the first time we've cried in awhile. We picked up the saddle we ordered and took it out to the cemetary last evening. I wish my scanner was working, I placed an ad in the paper with a birthday poem for him. It is in the mailbox right now, I just heard the paper lady pull up. My MIL said she placed an ad for him also, I am curious to see what theirs is. On Tuesday we mailed out something we had made for our friends and family. I went to a local copy place and had remembrance bookmarks made with a poem and his name, date, etc. and enclosed a short note of thanks and some scripture and a packet of forget me not seeds. I am afraid this day is going to drag by. George and the kids are still sleeping. We are going to make cupcakes this morning and take them out to the cemetary. I also bought some balloons we are going to have filled with helium and let the kids release them - I made little laminated tags to tie to them that said "In loving memory of our son on his first Heavenly Birthday, George Edw. 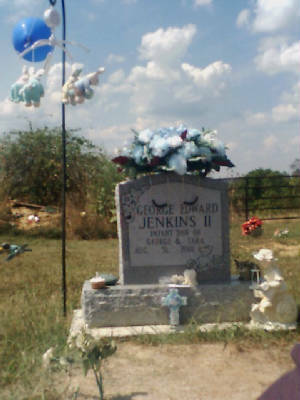 Jenkins II, August 31st, 2002." and put our name and address on the back - maybe someone will find it and write back. We will get down our box of memories this afternoon and look at all his pictures and the few momentos we have. I'm sure we'll be glad to have this day over with. I'm kinda disappointed none of our family has made plans to be with us today. Maybe they thought we'd prefer to be alone. I don't know what I want actually. 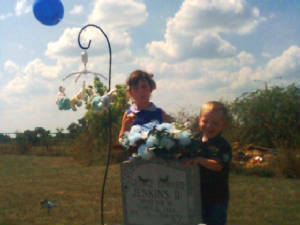 I will update this page later with pics from the cemetary and releasing the balloons. 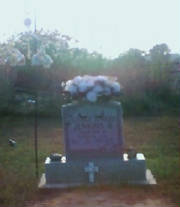 I know some others plan on taking things out to the cemetary for him, so we will get a picture of that also. 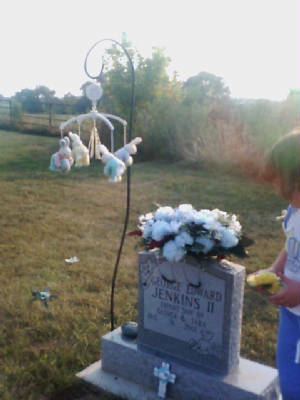 September 5th, 2002: Well, the day wasn't as bad as I expected. I was really, really disappointed that we didn't get any cards in the mail or even a phone call that day. We spent close to two hours at the cemetary. We took cupcakes and sang the birthday song. The ads in the paper looked Ok. I forgot to keep them though. We ended up spending some time at dh's mom and dads that afternoon, then they watched the kids for us while George and I went out to dinner. "Not only so, but we also rejoice in our sufferings, because we know that suffering produces perserverance; perserverance, character; and character, hope. And hope does not disappoint us......"